Harry John Strange was born in Birkenhead on 25 April 1923, the oldest of the six children of Harry and Margaret Strange. After his parents’ marriage broke up, he moved to London with his mother who had remarried Robert Lynn. Lynn adopted Strange as his son. He joined the RAF in 1941, soon after his 18th birthday, and was sent for air gunner training in 1942. He arrived at 1660 Conversion Unit in late 1942, and would seem to have met most of his future crewmates there. 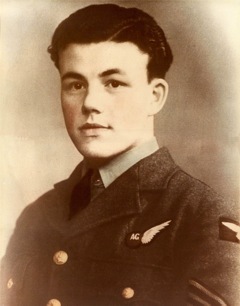 Although he joined 207 Squadron from 1660 CU on the same day, 11 November 1942, as most of the rest of the Ottley crew, he flew his first two operations with Sgt G. Langdon as pilot. His first operation with Ottley as his skipper was on 21 December on a trip to Munich. This was the day when the crew who would eventually fly on the Dams Raid with Bill Ottley all flew together operationally for the first time. Strange flew another operation with Langdon in January 1943, but on 2 February he made a permanent move to Ottley’s crew. He went on to fly on another twelve trips with Ottley, the last being their final operation in 207 Squadron, an attack on Kiel on 4 April 1943. He seems to have flown on most of the trips as the mid-upper gunner, but occasionally he swapped with Fred Tees, and flew in the rear turret. On the Dams Raid, Strange flew as AJ-C’s front gunner, thereby sealing his fate. Along with five others in his crew, he died when the aircraft was shot down near Hamm on 17 May 1943. Harry Strange and his comrades were originally buried in by the Germans in Hamm, but were reinterred after the war in Reichswald Forest War Cemetery. It’s also possible that if the ORB is what shows Strange and Tees switching places, the ORB is just wrong.